The curved portion of the track on a high lift garage door is above an added piece of vertical track. 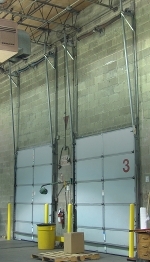 Vertical lift garage doors, shown here, are used frequently in industrial settings. 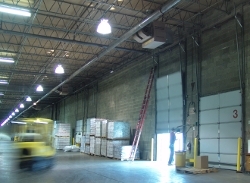 They efficiently use space in warehouses when used as dock doors. If you have read our Introduction to Standard Torsion Springs, you will already know that vertical-lift and high-lift garage doors work differently than standard-lift garage doors. The two primary differences are in the track and the cable drums. When a standard-lift garage door is closed, the top roller rests at the bottom of the curved portion of the track, or just below it. High-lift garage doors have a longer straight portion of track between the top roller and the curved portion of track (as pictured on left). Vertical lift garage doors do not have any curved portions of track. Instead, the garage door opens straight up and at a slight angle backwards. The track is angled back slightly to let the door close as a wedge, as mentioned on our homepage. Because the high-lift and vertical-lift garage doors open differently, these systems need different cable drums. Vertical-lift cable drums are not flat like standard-lift cable drums. Instead, the cable continually winds closer to the shaft on the drum as the garage door opens. High-lift cable drums are essentially a mixture of the vertical-lift and standard-lift cable drums. The first few times that the cable wraps around the drum, it moves closer to the shaft like a vertical-lift drum. At a certain point, however, the drum levels out and the cable continues to wrap around the drum at a constant distance from the shaft like a standard-lift drum. Why does the weight of the door need to exceed the lift of the springs? By using torsion springs that can almost lift the garage door, we are adjusting the net force acting on the door. When the sum of the forces applied to the garage door due to the tension in the cables is close to the force on the door due to gravity, a much smaller applied force (human or opener) is necessary to open the garage door. If the lift of the springs is greater than the weight of the door, the springs will lift the door off of the ground. The purpose of this different engineering is to properly balance the garage door. When the vertical-lift door is closed and resting on the floor, the weight of the door needs to exceed the lift provided by the torsion springs by a minimal amount (see left). As the garage door opens, the springs unwind. Meanwhile, the distance from the center of the shaft to the point at which the cable leaves the drum decreases. This distance is known as the moment arm. Why does the necessary upward force decrease by a factor of 2? When you are sitting on a seesaw and the other person moves toward the middle (the fulcrum), you move toward the ground. In an ideal system, a principle of static equilibrium tells us that F1D1=F2D2, where F corresponds to the weight of the two objects at their respective distances, D, from the fulcrum. Since the weight of the door (F1) and the moment arm of the torsion spring (D2) stay the same but the garage door's moment arm (D1) decreases by a factor of 2 as the cable winds up, the upward force applied by the spring (F2) must also decrease by a factor of 2. Therefore, the upward force necessary to balance the garage door decreases by a factor of 2 as well. Think a moment about leverage. Suppose you are trying to close the door to your house. If you push on the outside of the door near the handle, it is easy to close the door. If you push the middle of the door, it becomes twice as difficult. This is because the length of the moment arm is cut in half. The door will balance because the moment arm decreases as the door opens. A similar principle applies with the cable on the cable drum. When the garage door opens, the moment arm shortens. The effect of decreasing this moment arm by a factor of 2 will also decrease the necessary upward force by a factor of 2 (see right). In the time that it takes for the moment arm to decrease by a factor of 2, the tension in the torsion spring will also decrease by a factor of 2. As a result, the door remains balanced as it opens and closes. 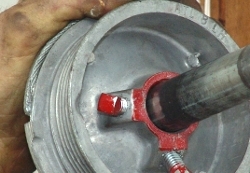 Standard-lift cable drums have a raised groove to help balance the garage door. A high-lift cable drum starts working in the same way as a vertical-lift drum, and then it operates as a standard-lift drum. 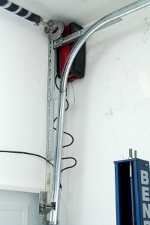 Since the garage door opens vertically at first, the cable drums need to decrease the moment arm as the springs unwind. Once the weight of the garage door starts to be supported by the horizontal tracks, the loss in door weight will be balanced by the loss of spring tension. As a result, the cable drum needs to be flat once the top section reaches the horizontal tracks. Most standard-lift cable drums have a very small portion of high-lift on the outside edge. This was added to cable drums once it was realized that the torsion springs must support the entire weight of the garage door until the top rollers reach the horizontal portion of track. Although most people are inclined to think that some of the weight will be transferred to the curved portion of track, this was not consistent with the what was practically observed. This raised portion of the standard-lift cable drums allows the garage door to open without the torsion springs losing extra lift in the first portion of the door's travel. If you are interested in converting from a standard-lift door to a high-lift garage door, see our High-Lift Conversion tutorial. If you have a residential door and you want to convert to a high-lift system, see our High-Lift Inquiry page after gathering the measurements listed in the tutorial to get a quote for a custom conversion kit.